Chelsea midfielder Cesc Fabregas is reportedly a major doubt for the Arsenal clash due to injury, in what looks a potential boost for the Gunners. 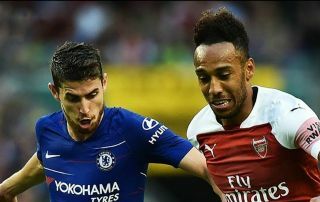 Although the Blues have plenty of other options in the middle of the park in the form of N’Golo Kante, Jorginho and summer signing Mateo Kovacic, Unai Emery will take whatever he can get after an opening day defeat to Manchester City and a tough second fixture as well. Fabregas has tended to play well whenever up against his old side Arsenal, so Gooners can be pleased with a report from the Metro stating he’s unlikely to play because of a knee injury. The Spain international remains one of the finest passers of a ball in Europe despite playing less of a key role for Chelsea in the last couple of seasons. Fabregas spent eight years at Arsenal earlier in his career before moving to Barcelona, and then to Chelsea. Many Arsenal fans must still hurt at the sight of their former star player and captain donning Chelsea colours, so they’ll be pleased he’s unlikely to be involved at Stamford Bridge at the weekend. Emery has been handed an extremely challenging early fixture list after replacing Arsene Wenger this summer, and could benefit from his opposite number Maurizio Sarri having fewer options to choose from. Prediction for Chelsea vs Arsenal?